The Erie Canal had a tremendous impact on the economic growth of the Albany area and points further west. First completed in 1825, the canal was one of the most important projects in the development and success of New York and the United States. The first railroad in the Capital Region ironically was built as a way to circumvent the slow down of barge traffic at Cohoes Falls. It was among the first railroads in the country and helped herald in a new age of transportation. Soon after the success of this early "pioneer" line, other railroads soon followed and the Capital District became a hotbed of economic growth and a leader in railroad transportation. This page briefly charts this explosive growth in chronological order primarily through maps. In 1830, construction began on the Mohawk & Hudson Railroad. In the autumn 1831, a 16-mile route between Albany and Schenectady was completed. Initially the line ended outside the two cities to avoid steep grades and the passengers covered the remaining distance in stagecoaches. By 1834, each end had an inclined plane with a fixed steam engine that was used to raise and lower the train. This system continued until 1841, when the tracks were relocated and actually connected the downtowns of each city. On April 19, 1847, the company name was changed to the Albany & Schenectady Railroad. The railroad was consolidated into the New York Central Railroad on May 17, 1853. The first steam locomotive to operate in the state of New York and the fourth built for service in the United States was named in honor of DeWitt Clinton, the governor of New York State responsible for the Erie Canal, who died in 1828. The locomotive began operations on the Mohawk and Hudson Railroad in 1831. A grand excursion on the Mohawk & Hudson Railroad occurred on September 24, 1831... The Robert Fulton (English engine) started to haul the train but broke down. The DeWitt Clinton (American engine) hauled three coaches, followed by seven platform cars, each drawn by a horse. The three coaches were stage coaches mounted on trucks, holding ten passengers each. The rails were wooden stringers, with iron straps nailed on top. The engine burned wood and the sparks therefrom constantly set fire to the passengers' clothes on this historic journey. "Each of the outside passengers who had an umbrella raised it as a protection against the smoke and fire. They were found to be but a momentary protection, for I think in the first mile the last one went overboard, all umbrellas having their covers burnt off from the frames, when a general melee took place among the deck-passengers, each whipping his neighbor to put out the fire." The Saratoga and Schenectady Railroad was opened from Schenectady to Ballston Spa in 1832 and extended to Saratoga Springs in 1833 for a total of 20.8 miles. The Rensselaer and Saratoga Railroad was completed on 1836, extending 25.2 miles between Troy and Ballston Spa. It was largely conceived and built by businessmen of Troy in response to Albany's construction of the Mohawk and Hudson Railroad and the newly created Saratoga and Schenectady Railroad. Despite its name, the railroad only reached to Ballston Spa and relied on the Saratoga and Schenectady to give it access to Saratoga Springs. Passenger service began on the line in 1936, extending the line of the Albany and Schenectady Railroad an additional 48 miles west from Schenectady along the north side of the Mohawk River to Utica. Because it paralleled the Erie Canal the railroad was prohibited from carrying freight. Finally in 1847 the ban was fully dropped, but the company still had to pay the equivalent in canal tolls to the state. On December 1840, the Albany and West Stockbridge Railroad opened from Greenbush to Chatham and to the Massachusetts state line on September 12, 1842. The Troy and Schenectady Railroad was begun in 1841 and trains began running from Schenectady to Troy, New York in the fall of 1841. It was 21.0 miles in length and constructed by the city of Troy. The Troy and Greenbush Railroad opened in 1845. It connected Troy south to East Albany (now Rensselaer) on the east side of the Hudson River. It was the last link in an all-rail line between Boston and Buffalo. Until bridges were built between Albany and Rensselaer, passengers crossed on ferries while the train went up to Troy, crossed the Hudson River, and came back down to Albany. The Troy and Greenbush Railroad become part of the greater Hudson River Railroad which extended all the way south to New York City in 1851. In August of 1848, the Saratoga & Washington Railroad was opened from Saratoga Springs to Gansevoort and by December of 1848, it was opened to Whitehall. In 1855, the name was changed to the Saratoga and Whitehall Railroad. It connected to other lines that extended into Vermont. Construction on the Albany and Susquehanna Railroad began on April 19, 1851, from Albany to Schoharie Junction. It was a 35-mile stretch that required 12 years to complete. In 1869, the line was extended to Binghamton, lengthening the railroad to 143 miles. The Albany and Susquehanna Railroad (A&S) was originally a 6 ft broad gauge railroad from Albany to Binghamton, New York, operating 1851 to 1870. It was built as a broad gauge to interchange easily with the Erie Railroad. It converted to standard gauge in 1876. The Hudson River Railroad entire line south to New York City (New York to Greenbush, now renamed Rensselaer, opposite Albany) was opened in 1851. The Troy and Greenbush Railroad become part of this greater Hudson River Railroad in 1851. The Albany Northern Railroad opened in 1853. The stretch between Albany and Cohoes was finished in April and by May to Waterford. By the end of June, the railroad was built all the way to Eagle Bridge where it connected with the railroad leading to Rutland, Vermont. It became the Albany, Vermont and Canada Railroad in 1856 and by 1859 it became the Albany and Vermont Railroad. It was a short-lived railroad. When the bridge across the Hudson north of Waterford collapsed*, the ROW east of the Hudson River was abandoned as most of it paralleled the Troy and Boston. It appears the Rensselaer and Saratoga absorbed most of the ROW west of the Hudson. The Adirondack Railway (originally Adirondack Company) was a railroad that connected Saratoga Springs to North Creek, New York, a distance of 62 miles. Built by Dr. Thomas Clark Durant, vice-president of the Union Pacific Railroad, it was started in 1864 and completed in 1871. By 1865 44 miles of the line were finished from Saratoga Springs up to Hadley. In 1866, the Saratoga and Hudson River Railroad was built, connecting Schenectady to Athens, a small town on the Hudson River across from the town of Hudson. In 1869, the New York Central Railroad and the Hudson River Railroad consolidated under the name of the New York Central & Hudson River Railroad. Following this period two tracks were added to the road from Albany to Buffalo, making the NYC & HRRR a four-track railroad, one of the first in the world. In 1870, the Albany and West Stockbridge Railroad was merged in to the Boston and Albany Railroad. The Schenectady and Susquehanna Railroad was completed between Schenectady, and Delanson, New York, a distance of 15 miles (24 km) in 1872. In 1873, it became the Schenectady and Duanesburg Railroad. The construction of third and fourth tracks between Buffalo to Albany was completed in the autumn of 1874. The Boston, Hoosac Tunnel and Western Railway absorbed the Troy and Boston and opened a connection in 1879 to Mechanicville, NY. This became a very important connection between New York State and New England through the Hoosac Tunnel. Known originally as the New York, West Shore & Buffalo Railway, the West Shore Railroad was organized as a competitor to the New York Central and Hudson River Railroad. By the early 1880s, the West Shore line leased the Saratoga and Hudson River Railroad, built the branch from Ravena to Albany, and completed the line south to Weehawken, NJ and well as continuing west eventually to Buffalo. The Boston, Hoosac Tunnel and Western Railway opened an extension west to Rotterdam Junction to connect to the the New York, West Shore and Buffalo Railway. Note the bridge across the Mohawk River was not completed until sometime after 1884 (see Rotterdam Junction historical map comparison). Although originally chartered in 1833, the Saratoga and Schuylerville Railroad wasn't built until sometime after 1875. From online research of antique maps (see comparison), it appears the first section was built sometime prior to 1884. In 1883, the New York, West Shore & Buffalo Railway and the Saratoga and Hudson River Railroad were consolidated into the West Shore Railroad. Competition for passenger and freight transportation became very keen between the New York Central and the West Shore and at one time (about 1885), a passenger-fare price-cutting war brought the fare on both roads down to the rate of one cent per mile. The West Shore became involved in financial difficulties and was absorbed by the New York Central in 1886. Although the actual dates are unclear, in the last half of the 1800s and at the turn of the century both the Saratoga and Schuylerville Railroad and the Greenwich and Johnsonville Railway added lines to connect at Schuylerville. In the late second half of the 1800s, electric trolley systems began to develop. City streetcar systems soon expanded to connect to neighboring towns and an intricate interurban transit network emerged. It was a short-lived era as automobiles and improved highways offered a more desirable alternative and sadly, by the 1930s, they had almost all been bankrupted and disappeared. For maps and more details on trolleys in the area, visit Capital District Interurbans. The numerous short lines that were created in the mid 1800s inevitably were gradually consolidated into larger and larger entities. Bankruptcies, mergers, acquisitions and expansions westward and northward all were driving factors on the consolidation process. By the turn of the century only a few regional carriers existed. Throughout the second half of the 1800s, the Delaware and Hudson Canal Company continually expanded by leasing and eventually absorbing railroad lines between the Pennsylvania anthracite coal fields and Canada. Originally a very successful gravity railroad and canal company, it changed its to the Delaware and Hudson Company in 1899. 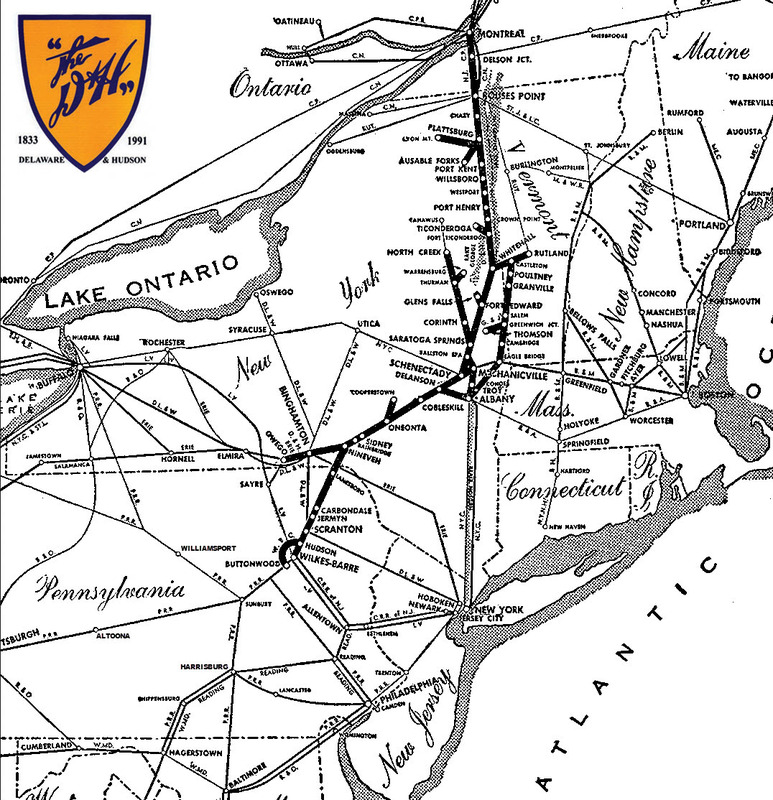 In the Capital District region, the Albany and Susquehanna, Rensselaer and Saratoga, Saratoga and Schenectady,and Schenectady and Susquehanna railroads all became an integral part of the Delaware and Hudson system. Already a through route from New York City to Buffalo and points west from its 1869 consolidation, both the West Shore Railway in 1885 and the Boston and Albany Railroad in 1900 became essential cogs in the powerful New York Central Railroad system. The New York Central became world famous for its high-speed high-class passenger service along the water route (the Hudson and Mohawk Rivers). Its most famous train, the 20th Century Limited, begun in 1902, was known for its red carpet treatment and first class service. It ran from Grand Central Terminal in New York to LaSalle Street Station Chicago and could complete the 960-mile trip in 16 hours. Around 1887, the Troy and Greenfield,the Boston, Hoosac Tunnel and Western, and the Saratoga and Schuylerville railroads all became part of the Fitchburg Railroad system connecting the Capital Region to Boston via the Hoosac Tunnel. A few smaller lines such as the Rutland (which absorbed the New York State route of Chatham & Lebanon Valley Railroad ) coexisted as well and Chatham, NY became a major rail hub during this era. The B&M leased the Fitchburg Railroad on July 1, 1900. This was primarily the main line from Boston west via the Hoosac Tunnel to the Albany, New York, area, with various branches. On December 1, 1919, the B&M purchased the Fitchburg Railroad. Sadly, the railroads were slowly replaced by the automobile and plane and even the major carriers couldn't survive. Miles and miles of track were abandoned, bankruptcies prevailed and only a few huge carriers absorbed the remaining main lines. The Delaware and Hudson Railway was acquired by the Canadian Pacific in 1991. It 2015, it was divided between the Norfolk and Southern and the Canadian Pacific. The mighty New York Central Railroad was merged with its arch rival the Pennsylvania Railroad in 1968 and failed miserably resulting in a government rescue and the formation of Conrail in 1976. The Boston and Maine Railroad was absorbed by the Guilford Rail System / Pan Am Railways network in 1983. Guilford/Pan Am mismanaged the system and in 1990 closed the Mechanicville yard: the largest rail yard and shop facilities on the B&M system. Eventually, Pan Am Railways entered a joint venture with the Norfolk Southern Railway in April 2009 to form Pan Am Southern (PAS) and service at B&M's former yard in Mechanicville, New York was restored as an intermodal and automotive terminal in January 2012 under PAS. The centers of Ballston Spa and Saratoga Springs were bypassed in the 1950s. New lines were built around them (#1 and #2). Round Lake was bypassed in the 60s. Although it made the route about 6 miles longer, a connector track was built between Crescent and a point south of Ballston Spa to replace it (#3). A huge fill and high bridge over the Kaydeross Creek was built to aviod the severe curve and numerous road crossings through the village. 13 miles of track was built with thefnanacial help of the state to avoid going direcly thru the city. In 1902, New York Central built the Schenectady Detour Project, also known as the "Carmen Cut-Off", it involved the construction of a 3.61-mile segment of new line between the vicinity of Carmen Station--at the top of the grade east of Schenectady--and the West Shore line near South Schenectady. This allowed heavy through freight trains to avoid the steep hill going into Schenectady. The relative importance of the Carmen Cut-Off declined after the Castleton Cut-Off was constructed and Selkirk Yard opened in about 1925. In 1924, a spectacular high-level bridge was constructed across the Hudson River north of Castleton. This allowed freight trains to avoid the congestion in Albany and the steep grade up to Karner Road. Shortly thereafter, the Selkirk Yard was built. It is a major rail yard for the northeast United States.